Just What the Heck is “Rural America”? Clearly farms on the Great Plains are rural and the city of Chicago is not, but where is the boundary between what is rural and what is urban? There is no simple answer. The U.S. Department of Agriculture, the federal agency with primary responsibility for rural America, has multiple definitions of what is rural. The Census Bureau has yet another. I rely upon a widely used USDA definition in which “rural areas” include everything that is outside a metropolitan area. These 1,976 counties were home to 46.2 million residents in 2015. “Metropolitan areas” include counties with a city of 50,000 residents or more, together with adjacent counties—mostly suburban—closely linked to these urban cores. More than 275.3 million people live in these 1,167 urban counties. More that 90 percent of the U.S. population was rural in 1790. By 1920, that number had dwindled to just under 50 percent. Today, only 15 percent of the population resides in rural counties. Growing economic and social opportunities in urban areas, coupled with mechanization and farm consolidation, caused millions of people to leave rural areas over the past century. The magnitude of the migration loss varied from decade to decade, but the pattern was consistent: more people left rural areas than arrived. Hundreds of rural counties have far fewer people today than they did a century ago. In many, young adults have been leaving for generations, so few young women remain to have children. As a result, deaths exceed births in these counties, producing a downward spiral of population decline. There were brief periods when the rural population rebounded in the 1970s and the 1990s. But, generally, the growth of the urban population throughout the 20th century has far exceeded that in rural areas. Between 2000 and 2015, the rural population grew by just 3.1 percent. Urban areas grew by 16.3 percent. Fewer births diminished population gains in almost all rural areas, but migration patterns varied. Surprisingly, rural places that had once been fast-growing—rural countries adjacent to urban areas and recreational counties—seemed to slow down more. Meanwhile, the remote rural areas that had historically lost many people to migration were less affected, because fewer were willing to risk a move in such uncertain times. It’s not yet clear whether the reduced number of births and diminished migration to rural America in the era of Great Recession will continue. 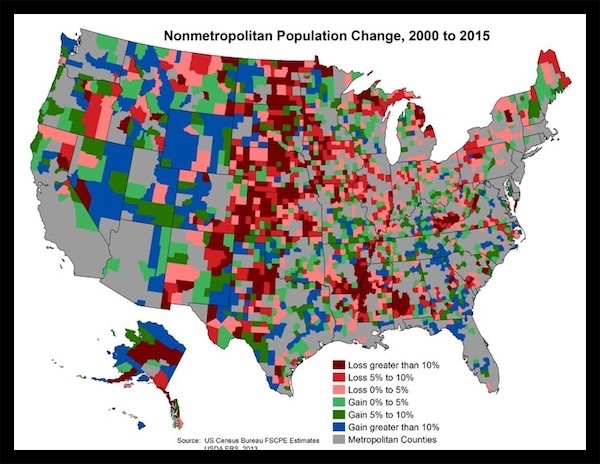 Other demographic changes are underway in rural America as well. The population is rapidly becoming more diverse. Minorities represent 21 percent of the rural population, but produced 83 percent of the growth between 2000 and 2010. Hispanics are particularly important to this growing rural diversity. Children are in the vanguard of this change. The rural minority child population has grown significantly recently, while the number of non-Hispanic white children diminished. Few people appreciate that the fates of rural and urban America are inextricably linked. Improving the opportunities, accessibility and viability of rural areas is critical—both to the 46 million people who live there and to the much larger urban population that depends on rural America’s contributions to their material, environmental and social well-being. A vibrant rural America broadens the nation’s economic, intellectual and culture diversity. Policymakers need to design comprehensive policies that can address the multifaceted challenges rural communities face. Fast-growing rural counties need programs capable of managing their growth and development. In contrast, rural areas with diminishing populations need policies to ameliorate the adverse impacts of this migration. Sustained population loss can affect the availability of critical services like health care, education and emergency services. Resources such as broadband, capital and expertise can facilitate new development. Kenneth Johnson is Professor of Sociology and Senior Demographer at the University of New Hampshire. His research has been supported, in part, by his Andrew Carnegie Fellowship from the Carnegie Corporation, by the Carsey School of Public Policy and by the New Hampshire Agricultural Experiment Station. The opinions expressed here are his own and do not represent the official views of the agencies supporting his research. Kennedy put men on the moon. Obama tried to put men in the girls' bathroom. What could go wrong? Rural America is where people objected to Obamunism. Far from declining, it grew--a lot--in 2016. And it is not a place. Rural America--we--are a state of mind.